Day 2 of our stamping event. A lot of walking, a lot of stamping demonstrations, always a time to stamp and always Prize Patrol or some type of give away, and recognition walks across the stage. Today I walked across the stage for my Flex Point (Sales+) and was honored to walk with two of my friends Evie and JoAnne … sorry, no picture of that. This is how we kicked off our evening session!! You will notice a blond coming through the crowd, that is Sara Douglass … she is our CEO!! 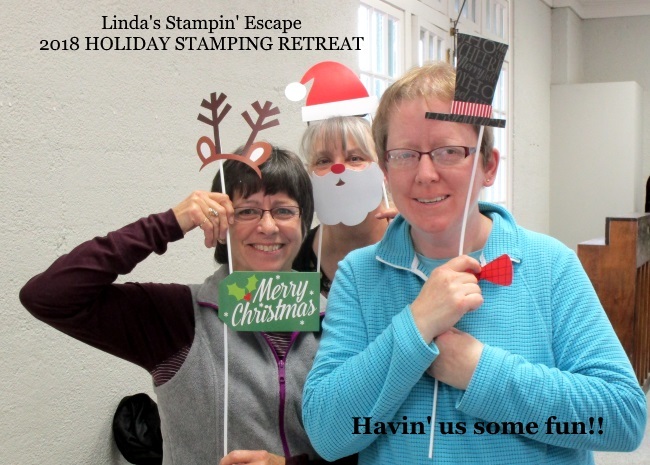 This is Evelyn Wood … we met years ago at a past Stampin’ Up! connection and have been friends ever since. This year we are sharing our goals with each other, so we can encourage each other to reach these goals! Evelyn’s and her group, the Stamping Sirens adopted me (LOL) because I came alone to OnStage. What lovely ladies … really, they are a hoot!! We went out to dinner together and had an awesome time. 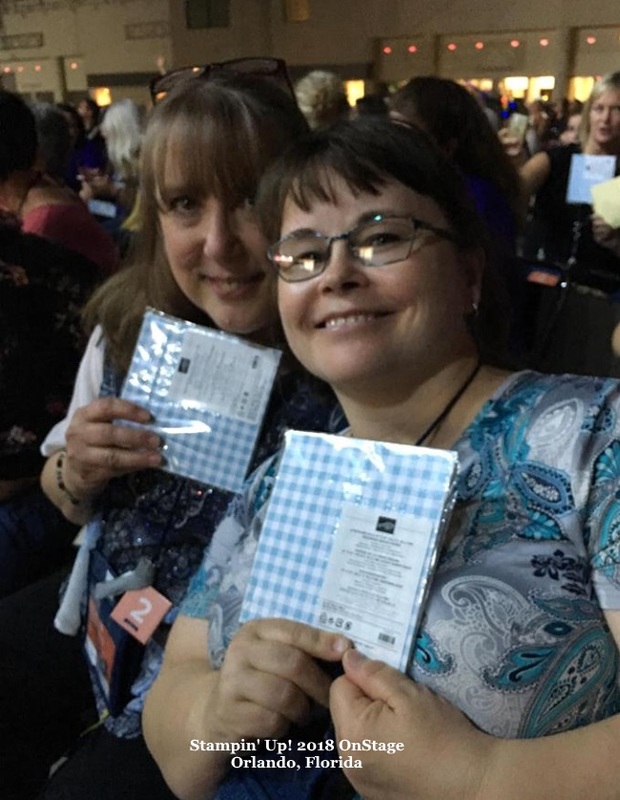 Our picture taking began after we received another give-a-way … the new Gingham Designer Paper! The colors are awesome!! YOU are going to love it ❤ I do!! Now let me introduce you to Greta … we actually met on-line and have chatted for almost a year. We decided to meet face to face here at OnStage, it was so nice to meet her in person. I also got to meet her upline Bente too. 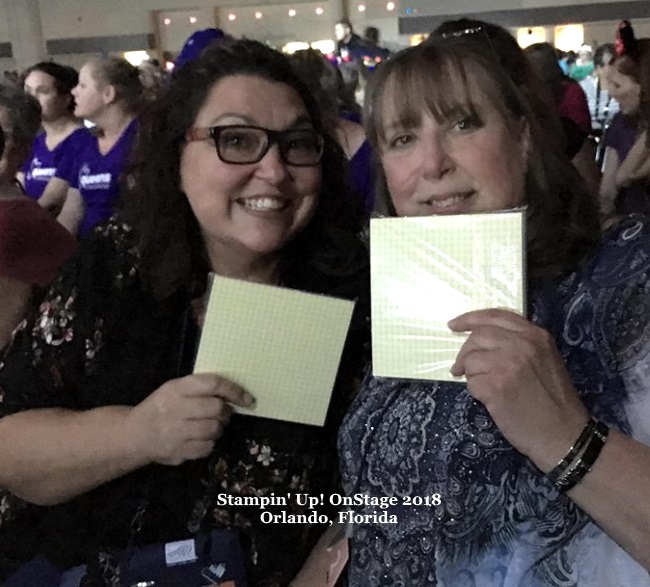 Walking across the stage for recognition is fun, and going on the Incentive trips are even better … but the best and most important thing for me in my Stampin’ Up! journey is all the beautiful people I have met. Whether they are fellow demonstrators or my downline or my customer aka: stampin’ friends, I would not have been doing this for 18 years without them!! Together we create magic with ink and paper and bring happiness to others when we send our cards out, and that magic brings friendships and fun with it. If you need a creative outlet, or if you want to meet new people, or if you want to have fun … I invited you to sit down a chat with me, because I would love to share this amazing opportunity with you. It’s too good not to share! Today is our last day at OnStage, kind of sad, but I will share more of the fun with you.